Airbus announced that it is to implement new fixed and deployable flight recorders on its passenger aircraft in collaboration with L3 Technologies. The new devices will come in two versions: a fixed crash-protected Cockpit Voice and Data Recorder (CVDR), capable of recording up to 25 hours of voice and flight data on a single recorder; and an Automatic Deployable Flight Recorder (ADFR). This new CVDR will be lighter, more compact, and will provide new capabilities compared with current generation of recorders, including versatile interfaces. The new CVDR answers the EASA and ICAO requirement to extend the duration of voice recording to 25 hours. The current requirement calls for a duration of two hours of voice recording. Two of these new CVDRs would be fitted on the shorter-range A320 airliners. This will greatly increase the redundancy for both voice and flight data recovery. The other version of the new recording system – the ADFR – is aimed at longer range aircraft, with extended flight time over water or remote areas, such as the Airbus A321LR, A330, A350 XWB and A380. The ADFR will add a new capability to commercial airliners: the ability to be deployed automatically in case of significant structural deformation or water submersion. Designed to float, the crash-protected memory module containing up to 25 hours of recorded cockpit voice and flight data will be equipped with an integrated Emergency Locator Transmitter (ELT) to help rescue teams to rapidly locate and recover flight recorders. The deployable ADFR will be installed in the rear of the fuselage, while a fixed CVDR will be installed near the front of the aircraft – thus greatly increasing the redundancy for both voice and flight data recovery, compared with today’s systems. The ADFR unit together with its mechanical ejection system will be designed and manufactured by Leonardo DRS and integrated by L3 in partnership with Airbus cross-programme Engineering. 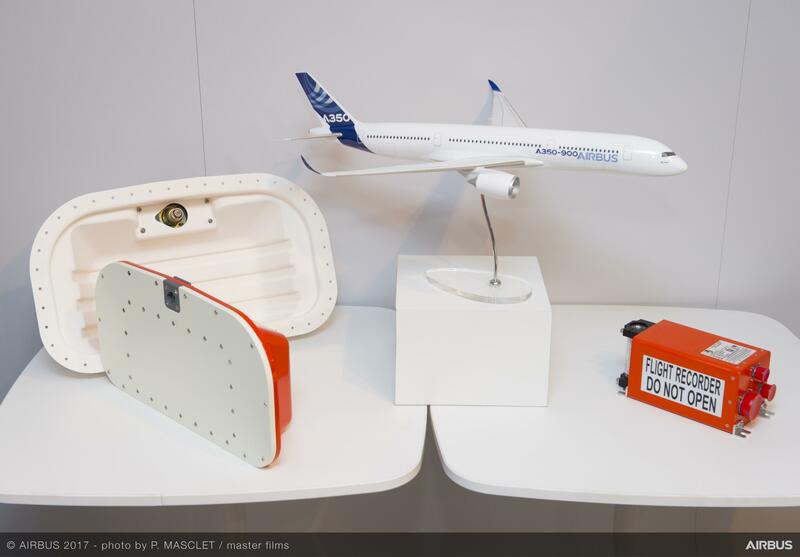 The new recording systems will be available in 2019 initially on the A350 XWB, with subsequent deployment on all other Airbus aircraft types.